Ravencoin RVN is a new cryptocurrency in the crypto market. Its code base is similar to that of Bitcoin. Actually, it is said to use Bitcoin’s code base. The project has taken nine years to come up with the crypto coin with more than four hundred contributors being involved in the project. Ravencoin RVN specifically focuses on providing a robust blockchain that is secure and stable. Its users are bound to enjoy the benefits of an optimized, dedicated code base for issuing digital assets like tokens. Even with the launch of the coin and listing on a number of exchange platforms, the project is still under development. The white paper and the road map of the cryptocurrency is yet to be released and the development team is working day and night to ensure they have all this ready within the shortest time possible. At the beginning of April 2018, Ravencoin’s development team is released its road map and also launched its comprehensive whitepaper. This will automatically create a new beginning for the crypto coin giving it a new oomph. The roadmap alone will set the pace for the coin since this is what every investor looks at before investing in any coin. 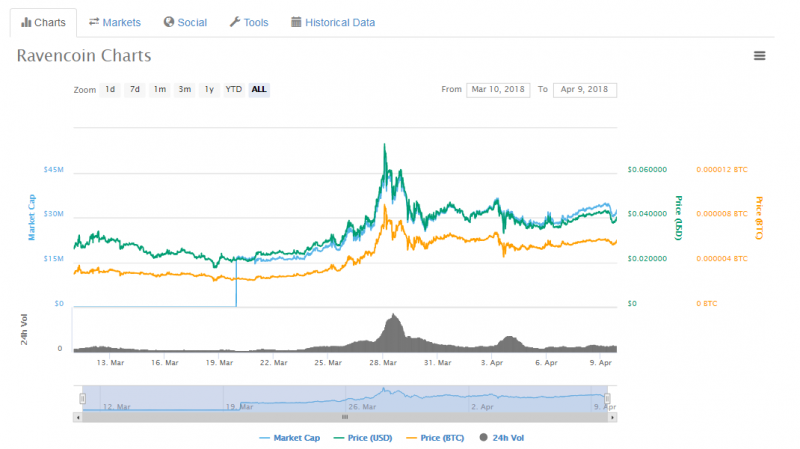 Since its launch in March 2018, the crypto coin has been able to maintain a bullish trend in its value. The coin has registered a 80%+ growth in value over a period of less than a month and this is a very great achievement, especially considering that it was released at a time when the cryptocurrency market is experiencing some storms. At the moment, even the most reputable crypto coins are registering very large drops in their value. At the moment, a single Ravencoin is going for $0.039915 USD or an equivalent of 0.00000591 BTC. Although it is a slight drop in value, the coin is expected to gain momentum especially after the lauch of the whitepaper and its roadmap. The circulating supply is 809,590,157 RVN out of the maximum supply of 21,000,000,000 RVN. This means miners have a long way to go. The crypto coin uses X16R Algorithm and Proof of Work mechanism. The available Ravencoin mining options are either CPU or GPU mining. The block time is 1 minute with a block reward of 5000 RVN. Does this crypto coin has a future? Should you invest? This is the kind of crypto coins that investors look for. A coin which goes against all odds to emerge successful! Looking at its performance within the short period that it has been in the market and how it has fared compared to the rest of the crypto coins, this is the coin to go to. For example, let’s do an approximation: Assuming that you purchase 1000 RVN coins today at the current price of $0.039915 USD. This would cost you around $39.92 USD. If the coin grows by half the current growth rate in the coming month, it would register a growth of 40%. This means by the end of April, your RVN coins will be worth $55.89USD. In a month you will have a profit of $15.97 USD. Multiplying this for a year, you will have $191.64 USD out of just $39.92 USD. Verge XVG Sails through the Rumors: Could TokenPay be the Mystery Partner?